Boise 7, Spokane 4: Danny Edgeworth went 2 for 5 with two RBIs and the visiting Hawks (1-0) beat the Indians (0-1). Spokane scheduled starter Hans Crouse injured a finger on his pitching hand during warmups and was scratched. 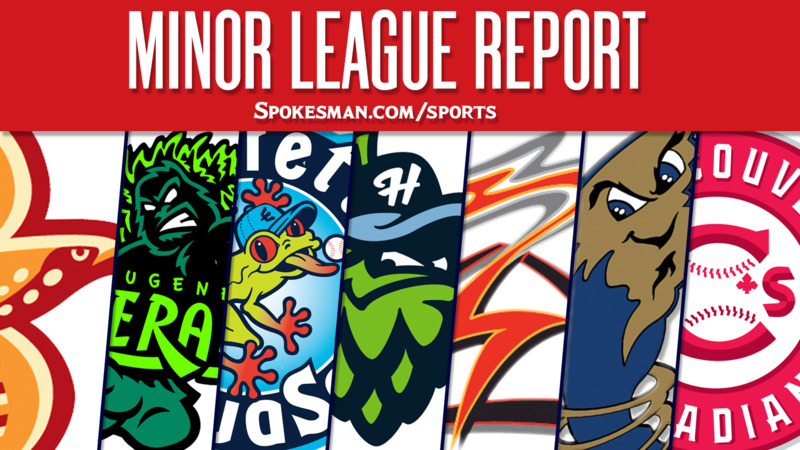 Salem-Keizer 4, Tri-City 3: Robinson Medrano went 2 for 3 with a solo home run and the Volcanos (1-0) edged the visiting Dust Devils (0-1). Tre Carter homered for Tri-City. Eugene 2, Vancouver 0: Faustino Carrera (1-0) struck out five over six two-hit innings and the Emeralds (1-0) blanked the visiting Canadians (0-1). Jonathan Soto went 2 for 3 and drove in a run for Eugene. Hillsboro 5, Everett 2: Kenny Hernandez (1-0) struck out six over five three-hit innings and the visiting Hops (1-0) topped the AquaSox (0-1). Tra’mayne Holmes hit a two-run homer and Joey Rose added a solo shot for Hillsboro. Sacramento 3, Round Rock 1: Ryan Hanigan drove in two and the visiting River Cats (33-35) topped the Express (30-37). Jeff Samardzija on a rehab assignment from the San Francisco Giants pitched three one-hit innings with four strikeouts and no walks for Sacramento. Frisco 4, San Antonio 2: Josh Morgan’s two-run home run in the ninth inning lifted the RoughRiders (22-45) over the visiting Missions (42-25). Carlos Garay smacked a two-run homer in the first inning for Frisco. Adam Parks (1-2) picked up the win with two innings of shutout relief with three strikeouts. Down East 5-5, Frederick 7-3 (DH): Brendon Davis went 2 for 4 with two RBIs in the second game and the visiting Wood Ducks (35-33) split a doubleheader with the Keys (33-34). Steven Bruce (1-3) was roughed up for six runs, four earned, on nine hits and a walk over four innings in the first game. Hickory 4, Lakewood 3: Preston Scott went 2 for 5 with two RBIs and the visiting Crawdads (30-36) edged the BlueClaws (39-28). Tyler Phillips (4-5) allowed three runs on 11 hits over six innings for the win. Yohander Mendez (No. 7 prospect) made his first MLB start for the Rangers and allowed six runs on seven hits and two walks over three innings and the Colorado Rockies won 9-5. J.R. Martinez (No. 3) went 0 for 4 with a walk and a run in Spokane’s 7-4 loss to Boise. Hans Crouse (No. 4) was scheduled to start for Spokane but injured a finger on his pitching hand during warmups and was scratched. The injury is not believed to be serious. Published: June 16, 2018, 5:55 a.m. Updated: June 16, 2018, 2:23 p.m.